Idemia showcased the new Morphowave Compact at Intersec 2019 in Dubai. MorphoWave Compact is a wall-mounted alternative to the award-winning MorphoWave Tower that is 86% smaller and 93% lighter, while retaining the same large fingerprint scanning volume and delivering the same field-proven performance. To protect their premises, organisations require access control solutions that are reliable, dependable and do not slow people down. 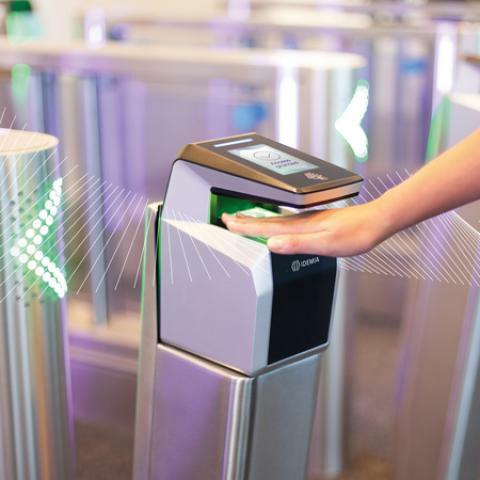 IDEMIA relied on its patented, touchless 3D fingerprint technology to develop first a product meeting these needs in high-traffic environments: MorphoWave Tower by IDEMIA has rapidly become the benchmark in frictionless access. The overwhelming success of MorphoWave Tower deployments in major Fortune 500 companies across the globe not only proves the technology delivers on its promise, but also confirms the opportunity to use it everywhere. MorphoWave Compact by IDEMIA is designed specifically with this in mind: to allow organisations to leverage the technology beyond the lobby, at every door. MorphoWave Compact acquires four fingers in 3D for maximum accuracy, with one pass of the hand over the sensor. This ergonomic touchless solution delivers an unmatched combination of security, convenience and throughput. MorphoWave Compact’s reduced size comes with a very competitive cost of ownership, an IP65 rating and a rich feature set that includes time & attendance functions. Thanks to this solution, organizations can now ensure a frictionless access experience everywhere to authorized users… with a simple wave of their hand.